Issues are not neutral. This study about the Dutch 2016 referendum on the EU–Ukraine association treaty asks which issues dominated the news media in the campaign, how the news about these issues influenced the saliency of benefits and disadvantages of the treaty, and how the latter in turn influenced turnout and the vote. A content analysis of newspapers and television news shows that trade and democracy were much more prominent in the news than EU support for Ukraine against Russia. 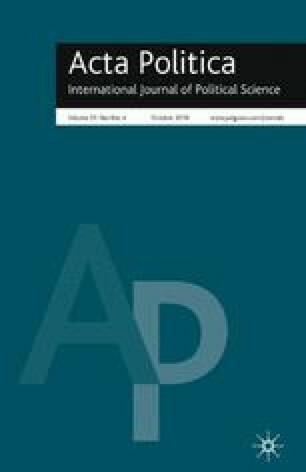 Linking the content analysis to a long-term panel survey reveals that issue news in self-selected media influenced the saliency of benefits and disadvantages of the treaty. The latter motivated voters to cast a vote, but priming was only partial since the voters’ “Yes” or “No” was primarily driven by prior dissatisfaction with the EU and the national government. The online version of this article ( https://doi.org/10.1057/s41269-018-0104-2) contains supplementary material, which is available to authorized users. The authors would like to express their gratitude for the detailed comments from the anonymous reviewers, the editor of the special issue Kristof Jacobs, and the editor of Acta Politica, Rens Vliegenthart. Jacobs, K., van Klingeren, M., van der Kolk, H., et al. 2016. Het Oekraine-referendum: nationaal referendumonderzoek 2016. https://kennisopenbaarbestuur.nl/rapporten-publicaties/het-oekra%C3%AFne-referendum-nationaal-referendum-onderzoek-2016/. Kleinnijenhuis, J., and W. Van Atteveldt. 2018. Dataverse with Partial priming: How issue news shapes issue saliency, which shapes turnout but not the vote (Publication no. hdl/10411/QVPJRM). DataverseNL. https://hdl.handle.net/10411/QVPJRM.